People are funny when it comes to grapefruit. Folks hate them or love them. There’s no in between. Trying to turn around a grapefruit-hater is like convincing a carnivore that tofu tastes like chicken. But the type of grapefruit makes a difference. When we moved to Florida many moons ago (about 330 is close), we rented a house near an old, abandoned grove. The white grapefruit needed sugar— badly. Red grapefruit from one of our trees is sweet enough for some of us to enjoy as is. My wife needs sugar on hers. 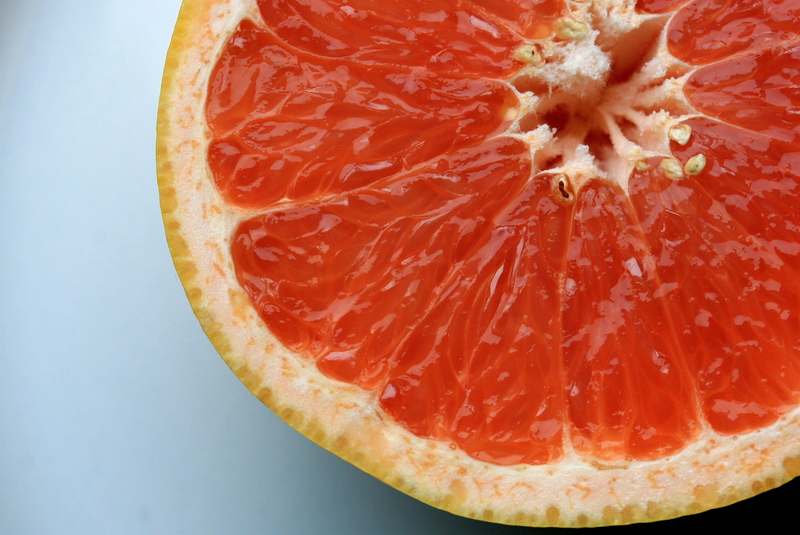 Grapefruit is really a chameleon in citrus skin. It can go almost everywhere oranges, lemons, and limes can. Look at your favorite orange recipe and imagine it with grapefruit instead. You might have to add some sugar for your sweet tooth. Lang’s Sun Country Groves on U.S. 17 east of Lake Alfred has a restaurant called Taste of Florida Café, which is famous for Mary Lang’s Grapefruit Pie. Red grapefruit is the backbone but strawberry gelatin gives it body and color. The recipe is on the company website www.langsuncountry.com. After August 4, when the Chalet Suzanne in Lake Wales has closed its doors, we will have to do our own Broiled Grapefruit. Nothing to it. Sprinkle some light brown sugar on grapefruit halves and slide them under the broiler. Repeat the sugar until you get a nice caramelized topping. A little cinnamon or freshly grated nutmeg will add something extra. While a pitcher of grapefruitade is chilling in the fridge, run the peel across a grater set on a piece of waxed paper. You can do this before squeezing to get the juice if you like. Freeze the shreds for later. Lemon meringue pie was a favorite when I was a boy but my mother made the filling from a box. Not from a box, really, but the powder in the box. You know what I mean. Get out your mom’s Lemon Meringue Pie recipe and substitute grapefruit for the lemon part. Then, sprinkle the meringue with some of the grapefruit gratings. Nothing says grapefruit can’t go in savory dishes. Drizzle a little juice in a stir fry chicken dish. We poach fish often because, if you’re gentle, the fish stays tender, and it doesn’t smell up the house for days. A little off topic… a sure-fire way to cut short visits by pesky people is to invite them over the day after a meal of fried fish and broccoli. The water you poach fish in benefits from extra flavor. Add a cup or so of grapefruit juice or a few hearty slices of fruit to the water and let it simmer a while before adding the fish. Start a meal with grapefruit by adding sections to salads. Throw in some pecans and interesting vegetables for a fun first course. Make it into a lunch or light summer supper by adding cold, peeled shrimp or scallops. A grapefruit sauce, instead of lemon, will make plain battered fish into a special occasion. Thicken a sweetened grapefruit juice and water mixture with a cornstarch slurry— one tablespoon cornstarch and three tablespoons water— adding the slurry to the simmering juice mixture. When it’s as thick as you think a sauce should be, take it off the heat. A drop of yellow food color makes it look as fun as it tastes. You can add cinnamon, nutmeg, allspice, cardamom, or curry powder to pump up the flavor. Add sake, lemon juice and sweetener. Shake vigorously. Strain into an old fashioned glass filled with ice and garnish with a piece of grapefruit rind. Making grapefruit look pretty can go a long way to winning over folks who don’t like it. Pare fresh coconut with a potato peeler to make long, thin slices to top a bowl of grapefruit sections. It looks nicest with pink or red grapefruit. To top white grapefruit, toss the coconut in a sandwich bag with a drop of green food color.